Daqo New Energy Corp. (NYSE: DQ) (“Daqo New Energy” or the “Company”), a leading manufacturer of high-purity polysilicon for the solar PV industry, today announced that its subsidiary, Xinjiang Daqo New Energy Stock Co., Ltd., a PRC joint stock company (“Xinjiang Daqo”), formerly Xinjiang Daqo New Energy Co., Ltd., has filed an application with the National Equities Exchange and Quotations, an emerging over-the-counter market in China (the “New Third Board”). Xinjiang Daqo operates the polysilicon production facilities of the Company located in Shihezi, Xinjiang Uyghur Autonomous Region. Daqo New Energy currently owns 99% of the equity interest of Xinjiang Daqo following a corporate restructuring completed in December 2015 to enable Xinjiang Daqo to meet certain PRC legal requirement for listing on the New Third Board. Prior to the restructuring, Xinjiang Daqo was a wholly owned subsidiary of Daqo New Energy. In the event that Xinjiang Daqo successfully lists on the New Third Board, the current intent of the Company is that, immediately following the listing, Daqo New Energy will own a substantial majority of the outstanding equity interest of Xinjiang Daqo and continue to consolidate its financial results. There is no assurance that Xinjiang Daqo will successfully list on the New Third Board. Xinjiang Daqo’s listing is subject to, among other things, market and business conditions and Xinjiang Daqo satisfying relevant rules of the China Securities Regulatory Commission and the applicable securities exchange and other applicable registration, listing and offering requirements and obtaining requisite regulatory approvals of its listing application. Founded in 2008, Daqo New Energy Corp. (NYSE: DQ) is a leading manufacturer of high-purity polysilicon for the global solar PV industry. As one of the world’s lowest cost producers of high-purity polysilicon and solar wafers, the Company primarily sells its products to solar cell and solar module manufacturers. The Company has built a manufacturing facility that is technically advanced and highly efficient with a nameplate capacity of 12,150 metric tons in Xinjiang, China. The Company also operates a solar wafer manufacturing facility in Chongqing, China. This announcement contains forward-looking statements. These statements are made under the “safe harbor” provisions of the U.S. Private Securities Litigation Reform Act of 1995. These forward-looking statements can be identified by terminology such as “will,” “expects,” “anticipates,” “future,” “intends,” “plans,” “believes,” “estimates” and similar statements. 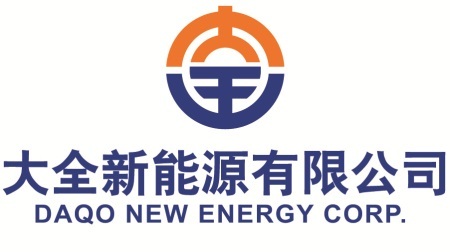 Among other things, Daqo New Energy’s strategic and operational plans, including with respect to Xinjiang Daqo’s potential listing on the New Third Board, contain forward-looking statements. The Company may also make written or oral forward-looking statements in its reports filed with or furnished to the U.S. Securities and Exchange Commission, in its annual reports to shareholders, in press releases and other written materials and in oral statements made by its officers, directors or employees to third parties. Statements that are not historical facts, including statements about the Company’s beliefs and expectations, are forward-looking statements. Forward-looking statements involve inherent risks and uncertainties. A number of factors could cause actual results to differ materially from those contained in any forward-looking statement, including but not limited to the following: the demand for photovoltaic products and the development of photovoltaic technologies; global supply and demand for polysilicon; alternative technologies in cell manufacturing; the Company’s ability to significantly expand its polysilicon production capacity and output; the reduction in or elimination of government subsidies and economic incentives for solar energy applications; and the Company’s ability to lower its production costs. Further information regarding these and other risks is included in the reports or documents the Company has filed with, or furnished to, the Securities and Exchange Commission. Daqo New Energy does not undertake any obligation to update any forward-looking statement, except as required under applicable law. All information provided in this press release is as of the date of this press release, and Daqo New Energy undertakes no duty to update such information, except as required under applicable law.